I have used this doll in individual counseling sessions, in which students choose three discs to place inside the pocket in the "tummy" then we either talk about what triggered these emotions, or how to calm down (or both). Recently, though, students will visit my office in break times and play with it independently. It's soft and cuddly, and even the toughest kids cannot seem to resist hugging and even whispering to it. It's magical! Learn more at the Kimochi website, including videos, lessons, and purchasing information. Years ago, I bought a "clapper board" as a memento from a trip to Universal Studios. I never thought it would become one of the most requested tools when I visit classrooms! I brought the board with me during a lesson that involved role plays. From the start, students begged to use the board (basically yelling "action!" and snapping the bar down at the top). 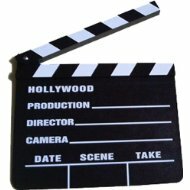 It became an excellent behavioral management tool; immediate silence fell with the promise of being the operator of the clapper board! I have found it most effective with students in grades 2-4. Fifth grade students suggested a neat alternative with the introduction of multiple "takes" of the same scenario, leading to epiphanies I had not anticipated! I discovered these handy decks of therapeutic cards during my elementary school counseling internship. Created by Bright Spots, the Thoughts and Feelings deck features cards with cheerful, brightly-colored pictures and the start of sentences for the players to complete with their own thoughts and feelings. I have used this deck when meeting with individual students who may be shy or reticent; I find that clients of all ages feel more comfortable sharing when the conversation is made to feel like a game! As a group icebreaker, I have asked partners to pick a few cards, use the prompts to guide their conversation, then share what they learned. I recently used several of these cards as a part of a small group conversation game called the Talking Boxes Game, as well! In addition to the Thoughts and Feelings deck, Bright Spots also offers a set which focuses on clients who are experiencing grief and loss. This deck is called Memory Garden: Bereavement Healing Cards. They can be used for both individuals and small groups, and are appropriate for young children as well as teens and adults. I highly recommend these sets for school counseling offices! What a fun, useful tool for individual, group, and classroom counseling! 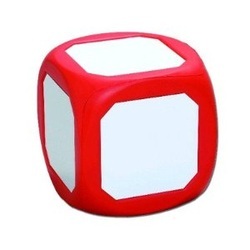 Students love using this die, which must be picked up with both hands for the younger ones. I recommend using dry erase crayons that don't smear off as easily. You can also make reusable flat magnets to slap onto the sides. It has so many uses, I don't even know where to start. Write feelings words or faces to play games about emotions. Write scenarios for lessons that require role plays. Have students generate methods for calming down, then practice them at the roll of the die. It's endlessly useful! Possibly the best thing I've ever purchased for my counseling office (…and no, I'm not kidding)! I keep the ball hidden and it doesn't come out often. However, it is an excellent tool for getting students- especially 4th and 5th grade boys- to open up as they play. 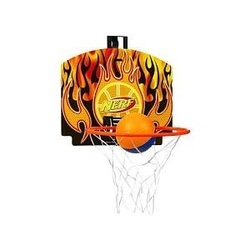 When I invite students to come to my room for lunch (with the hidden motive of getting shy students to connect with peers), they often bond while playing Nerf b-ball. And students who earn a perfect day on their CICO (check in/ check out) daily goal chart get to play for 5 minutes before they catch the bus home. Who knew?